I decided I will not doubt anymore if I can complete the marathon or drop midway. 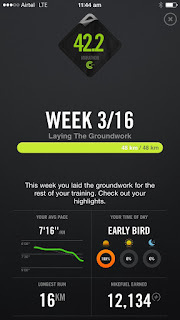 I have survived 2 weeks and I have run 86kms in 2 weeks - something I take 2 months or more to do. I have to be distracted when I run - either by a podcast or music or a good audio book. Sunday evening I was hunting for a good audio book. I discovered 7 years in Tibet - set against World War II. Had seen this movie long back - Brad Pitt was in it. Downloaded it and was looking forward for the morning run. Also, a friend of mine advised me to not run on concrete too much - I run around the parking lots - the hard concrete surface damages the knees in the long run ( hehe - unintentional pun ). So I moved to a nearby park - it was completely deserted because of the rain and the track was a mud track and was wet slippery and soggy at lot of places. Not sure if this will still be runnable after the Mumbai Rain comes in full force.